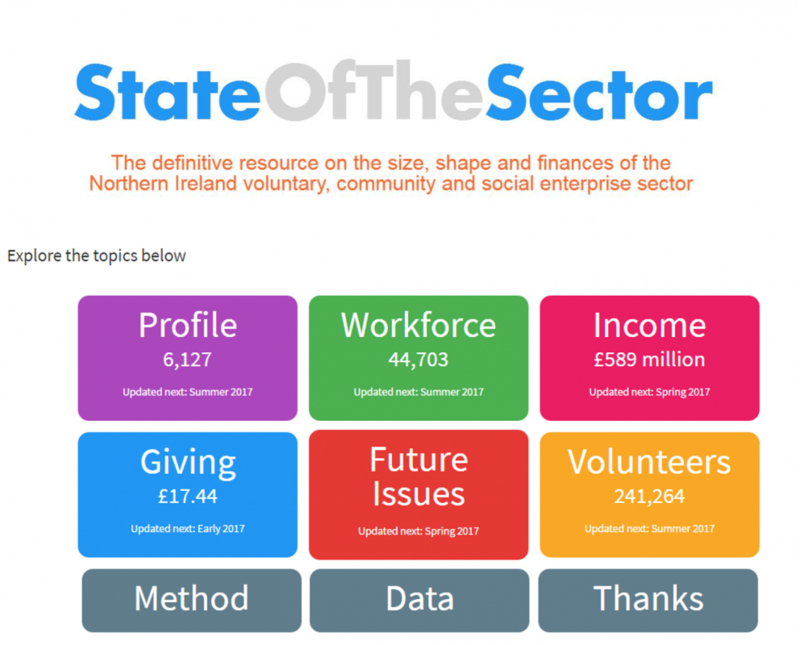 NICVA has published the latest State of the Sector research in a brand new online resource which you can explore here. This new online format enables users to easily navigate across the different sections of the research and download the data behind the research. It will also enable the Research Team at NICVA to update State of the Sector on a rolling basis, which means the information available to users will be more up-to-date than in previous formats. This article focuses on the Future Issues section of State of the Sector. These findings are drawn from the Sector Forecast Survey which was circulated in January 2016 to 4,113 organisations. The survey aimed to explore organisations’ opinions about future developments in the sector and operational changes they anticipated within their organisation over the forthcoming year. Reminder emails were sent in order to maximise the response rate alongside follow-up phone calls. A total of 944 organisations responded to the survey, giving a response rate of 23%. Key findings from the Future Issues section are presented below. Close to one-third of respondents (31.3%) expected their general situation to worsen, while 23.6% of respondents expected an improvement in their general situation over the next 12 months. This marks a decrease of almost 10 percentage points from 2012, when 32% of organisations expected an improvement over the next year. This suggests that organisations are feeling less optimistic than they did four years ago. A high proportion of respondents expected the economic outlook of the sector to worsen in 2016 (66.3%). A small proportion of respondents anticipated an improvement in the economic outlook (4.8%), while 21.5% expected it to remain the same. 38.1% expected their income to decrease in 2016, 29.5% expected it to remain the same and just 17.5% of respondents anticipated an increase in their income over the next 12 months. The majority of respondents expected the number of services and activities they provide to either increase or stay the same over the next 12 months. 94.2% of respondents did not envisage closing their organisation in 2016, while a significant proportion expected to undertake an organisational restructure (34%). 69.6% of respondents expected to collaborate with another organisation in the next 12 months, which marks an increase of 6.7 percentage points from previous State of the Sector research (2012). 6.3% of respondents anticipated merging in the next 12 months, this figure is almost unchanged from 2012 (6.6%). Over one third of respondents (38.6%) stated that the Northern Ireland Assembly had a negative impact on the voluntary and community sector over the last 12 months. This marks an increase of 26.7 percentage points since previous State of the Sector research (2012). The proportion of respondents that stated the impact has remained positive decreased by a small margin (2.5 percentage points), while the proportion of respondents that stated there has been no impact decreased from 35.9% in 2012 to 22.1%. One-third of respondents (33.6%) expected the Northern Ireland assembly to have a negative impact on their organisation's operating environment in 2016, 16.5% stated that the impact would be positive while 22.2% stated they were unsure. Over one-third (35.7%) of respondents stated that the transfer of powers to the new councils will have a negative impact on the voluntary and community sector, while 15.3% felt the transfer of powers will have no impact and 26.1% stated the impact will be positive. Respondents indicated that their most significant political relationship will be with local councils in 2016. Government departments and commissioning bodies and groups were ranked second and third respectively. The three main weaknesses/threats to organisations over the next 12 months identified by respondents were public sector cuts, lack of diversification of income and competition from other organisations. On 28th September NICVA’s Research Team will be presenting findings from State of the Sector at a research launch event. Paul Givan MLA, Minister for the Department for Communities, will be commenting on the research and will be outlining his priorities for the voluntary, community and social enterprise Sector at the event. You can register to attend here.